Get Ready for Poll Pads! Google the term “poll pad” and, despite the spelling difference, you’re likely to find something you weren’t searching for at all—cushioning for the post that holds up a basketball goal. Though you may see those kinds of pole pads if you vote in a school gymnasium on Election Day, the real poll pads will be at the registrars’ table at all 24 precincts in Putnam County. These state-of-the-art electronic tablets are expected to speed up the voting process and to significantly reduce the possibility of human error. I experienced the new technology first-hand as a registrar at the Cornerstone precinct on August 2, and I can say this with conviction: I LOVE POLL PADS!!! Here’s how things will work on November 6. When you enter your polling place, it won’t matter what letter your last name starts with. The alphabetically arranged poll books from decades past are gone. You’ll simply step up to the first available registrar and present your photo ID. If it has a bar code on the back, which is the case with Tennessee drivers licenses and handgun permits, it will be placed in a slot and scanned by the poll pad’s camera. If your ID doesn’t have a bar code, your name will be entered manually. Your information will appear on the screen and the registrar will ask you to confirm your name and address. The poll pad will show whether you’ve already voted, have been classified as inactive, are at the wrong precinct or are not in the system at all. If none of those possibilities are the case, you’ll be quickly processed and sent on to the voting machines. 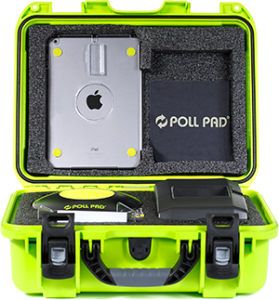 Estimates are that using poll pads rather than cumbersome printed binders will save one to two minutes per voter. That’s significant, considering that thousands of voters are expected to show up at the polls on Election Day. An added bonus is that human error is much less likely to occur. Registrars can’t miscode an application for ballot because the machine does it automatically. And those who fear that poll pads might be hacked can put those worries to rest. On Election Day, the internet is turned off. The only accessible program is the voter database. Though the machines and supporting equipment were expensive—about $1,500 per poll pad—the Putnam County Election Commission and the election staff believe they’re worth it. For one thing, streamlined check-in requires fewer poll workers and will thus save money over the long haul. And lines that move quickly and the probability of fewer mistakes will make for a more pleasant Election Day experience for both voters and poll workers. Early voting ended last Thursday. But if you’re a registered voter who missed it, head to the polls Tuesday and experience poll pads for yourself. All Putnam County precincts will be open from 9:00 a.m. until 7:00 p.m. on November 6.